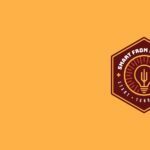 Smart From Scratch® Now Available! Whose responsibility is it when it comes to the success rate of an online course? Put another way: if one of your students fails to see results after buying access to your online course, is it your fault, or their fault? Responsibility lies with both parties, but the fault of a failing student depends on a number of factors, which I’ll dig into here in this post. Whether you sell (or plan to sell) online courses, or you’re a student who takes online courses, increasing your success rate is a worthy target. Let’s talk about how you can do that. All of this is on top of my mind because on Monday, February 27, my brand new online course, Smart from Scratch, will go live. It was first launched late last year to a limited number of students on a very specific segment of my email list, which is why most of my audience didn’t even know about it. It’s gone through a number of upgrades and tweaks since then, thanks to the amazing feedback from those initial students. Click here to sign up to learn more about Smart from Scratch and get on the waitlist for the launch. In terms of success rate, it goes without saying that every successful online course should, at a minimum, have the information needed to help a student achieve a specific result. Without that base of information, the student is always going to fail. On a similar note, a course creator must always make sure incoming students have the right set of expectations. If a student’s expectations differ from what is actually in the course or what the outcome will be, then the student is doomed to fail from the start—and that’s on the course creator. 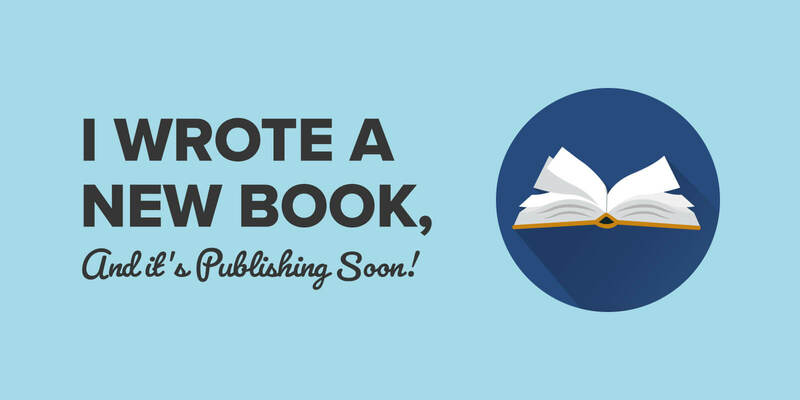 Expectation starts with what’s promised in the promotional material and sales page. Expectations are also wrapped up in the onboarding process and welcome video. These are things I’ve learned first hand from the dozens of courses I’ve paid for. Many of those courses proved to be extremely useful and I wouldn’t be where I am today without them. Other courses I’ve had access to were filled with poor information, and there were a few that weren’t what I had expected at all. Easy to login and gain access to. A great welcome video with an overview of what’s coming. Easy navigation through the course and content. A way for me to easily understand where I’m at in the course versus how far I have left to go (i.e. a progression meter). Course content that helps me understand new concepts without making me feel like an idiot. Workbooks or worksheets to help me through some of the action items within the course. Periodic check-ins from the course creator via email to make sure I’m on task, especially if it includes answers to frequent questions. No “fluff” or filler content that just seems like it’s there to take up time. Call-outs and reminders within lessons (especially within videos) to remind me of what’s important and what I need to do. A community to ask questions and connect with other students. As much as it is the responsibility of the course creator to help their students succeed, responsibility lies within the student, too. It’s exactly like taking courses in high school or college: the same material is shared with the entire class, however some students earn As, and some earn Fs. Without the proper approach, mindset, and work ethic, a student is doomed to fail no matter how great the content is, or how encouraging the course creator may be while going through it. 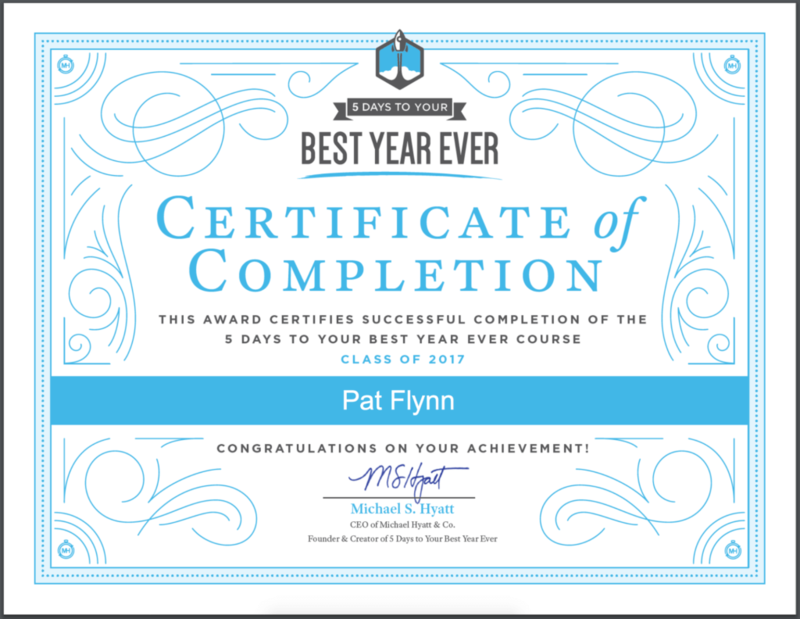 My most recent course purchase was Michael Hyatt’s 2017 edition of 5 Days to Your Best Year Ever, an online course that he promoted last December to help his students achieve their big goals for the year. It was a great course that incorporated almost all of the course creator strategies I mentioned before, and was the perfect way to start the year with all of the giant goals I’ve created for myself. Read about my goals (and goals set by the SPI community!) here. 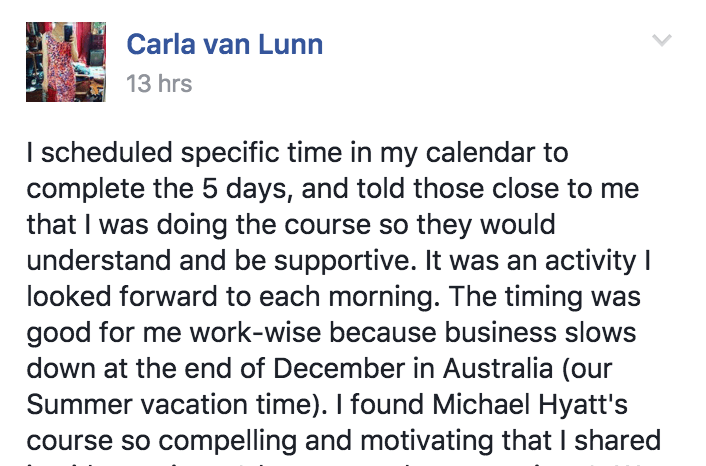 Also, as an affiliate for Michael’s course, I setup a special Facebook Group as a bonus for anyone in the SPI community who purchased through my link, which has become a great resource for me and the other students in the class. While going through the course material, I paid careful attention to the approach that other students were taking to set themselves up for success, and the first thing that was very apparent was that the students who got through the material were the ones who made sure to plan ahead and block out specific days and times to work through the course. You’ve got to show up to be successful. Make sure you always schedule time within your calendar to complete the course. If possible, make it a part of your daily routine until you finish. Too often I’ve seen people purchase courses only to sit back and let it collect dust. Maybe they log in once or twice, but it’s not consistent. As a result, the student cannot consume the content needed to achieve the desired result. Admittedly, when I was first building my business back in 2008, I purchased my fair share of courses that I never completed. A major reason for that was because I didn’t schedule time to take the course. Other times it was because I got distracted with other projects, or I just simply procrastinated and lost the energy to keep going. The deeper issue here—more than just what’s on the calendar and honoring that time block—is commitment. That means not just purchasing the course and cracking it open because it’s there, but having the true desire and drive to complete the course and its tasks for a reason. The better you understand your why, and the benefits you will gain after completion, the more likely you are to do all of the things necessary to login consistently, stay on schedule, and ultimately become a successful student. Make it your mission. I love that. Don’t be afraid to start over or rewatch something. 1. Remove as many possible distractions as possible. Not only is blocking out time in your calendar important, but you should also aim to consume course content in a distraction-free environment. Turning notifications off on your phone (i.e. airplane mode) and on your desktop. Communicate with people who may interrupt you to let them know you’ll be unavailable for a certain period of time. Use tools and apps like Self Control (iOS) or Cold Turkey (Windows), if needed, to stop yourself from going to Facebook, Twitter, or that other website you usually visit when you’re supposed to be working. 3. Speaking of Action Items . . . Do Them! Another common mistake students make is going through the content without ever doing any of the action items. Consuming content is just half the fun, but participating in the course and getting involved with the tasks you’re given is where the results come from. You can’t always predict the outcome of the lessons you learn and the courses that you take, but one thing is always going to be 100 percent true: if you don’t take any action, you’re never going to get any results. Many online courses come with access to a community of some kind, such as a forum or group with other students who are also taking the course. After surveying a number of people who have taken courses, many commented on just how important the community was for their success. You’ll never feel alone knowing there are other students in the same position as you are, and they’re only a few clicks away. A lot of helpful information typically comes up within these communities, such as answers to specific questions or clarification on items that may be more confusing than others. Beyond that, and what I personally love most about these groups, is that people are also there to share their wins and motivate you. One of the best ways to complete a challenging ongoing task is to find an accountability partner to help you through it. It’s like going to the gym. It’s much easier to stay motivated and complete your workouts when another is there doing it with you. If someone else you already know is taking this course, ask them. It’s a lot easier when you have a relationship already. That said, if you’re looking for a partner, propose the idea in any communities the course may have, and it’s likely you’ll find others in the group who will want to partner with you. If you get stuck or aren’t sure about something, that doesn’t mean it’s time to take a break. It means your next task is to try and find the answer. If there’s a community, start there. There may be conversations and answers related to your question already there. If not, just ask, and remember: there are no dumb questions! If there is no course-based community you can tap into, try other communities related in and around that topic instead, and if that’s not possible, don’t hesitate to send an email to the support team or course founder. Personally, I love receiving questions from my students because it shows me what else I could do to improve the course, and it’s always great for starting deeper conversations about the course and how things are progressing. Completing a course is not always easy, and depending on the course material, it can be quite a long journey. To keep yourself motivated throughout, and to show yourself that you’re making progress, make sure to celebrate your small wins along the way. From completing a single lesson, to finishing a page in your workbook, each of those little milestones add up to the much larger sum of success once the course is finished. On a similar note. . .
Make sure to celebrate your small wins along the way. One thing I love to do to help push me through a course is to allow myself to have some kind of reward after I finish. Sometimes it’s a special sweet treat that I’m really craving, or perhaps an hour or two of Rocket League on the PlayStation. It doesn’t matter what it is, but giving yourself something to look forward to can be another thing to stack in your favor to help you through some of the tough moments you’ll find during your course journey. Sometimes the first pass through isn’t the one that works for us, and that’s okay. Don’t worry about falling behind if you feel like you need to start over. In many cases, it’s the right thing to do. In my course, Smart from Scratch, starting over is quite common and actually encouraged! The purpose of the course is to help students validate their business ideas, so when an idea proves to be one that isn’t the right fit (for themselves and/or for their target market), then starting over is the next logical step. 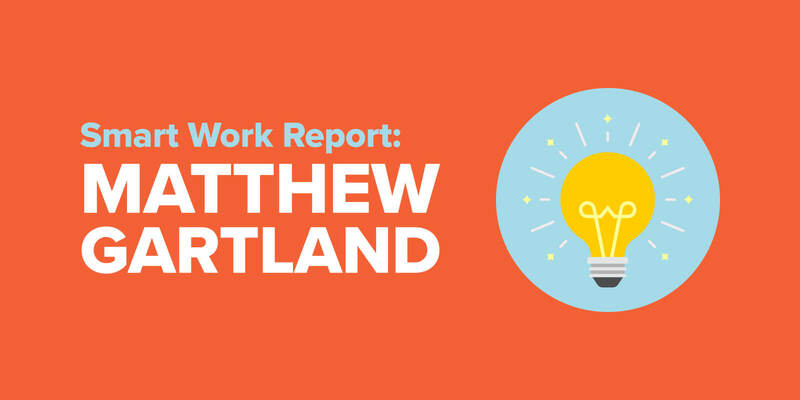 With each go-around, students accelerate through the process with new knowledge and experience and eventually will land on an idea that works. It’s the same experience through any courses that you may gain access to. If you need to start over, it’s not a fail—it’s another shot with a new perspective in mind. And finally, remember this: we live in an amazing era where we can gain immediate access to the incredible knowledge and experience someone else has to help improve our own lives. We take for granted just how lucky we are and how amazing our opportunities can be. Sometimes it’s a struggle and yes, it takes a lot of work to make progress, but when it comes down to it, make sure you’re having fun too. Enjoy the process and the learning, because it’s not always about the end result. It’s about the time and the journey it takes to get there. And before I go, real quick, I’d love to hear from you what courses you’ve taken in the past, for any purpose, and what was one thing you loved about that course. Just one. Your comments will eventually become an amazing resource for any course creators and students in the future.